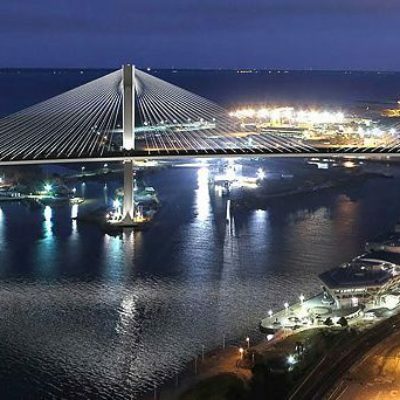 For many years, leaders in coastal Alabama have been discussing a bridge over Mobile River, traffic along I-10 and the need to improved infrastructure to support our growing economy. We are finally seeing traction with the Mobile River Bridge & Bayway Project, yet we still have several hurdles to overcome. In a recent TRIP Report for Alabama (2016), 50 highway projects were identified that are needed in order to support Alabama’s economic growth. TRIP, a national transportation research group, listed the Mobile I-10 corridor as the 2nd most critical project to economic growth in Alabama. “The amount of commerce that travels through our region is massive. Mobile is a key point along the Jacksonville – New Orleans – Texas corridor. If we do not solve this traffic jam soon, companies will find other routes,” says Wiley Blankenship, CEO of Coastal Alabama Partnership. Along with infrastructure benefits, the Mobile River bridge project is being heralded as a landmark design project, for its unique public-private partnership, and the opportunity to change the nature of coastal Alabama’s transportation network. Transportation infrastructure is key to the continued success of the Port of Mobile. As volume increases at the Port (20% last year at APM Terminals alone), the more important the ability to move containers and cargo becomes. Additionally, with the pending expansion of the channel in Mobile Bay, the Port will see increased traffic. In a letter to the Corp of Engineers, Alabama’s congressional delegation expressed full support of the proposed expansion plan. Coastal Alabama Partnership (CAP) fully supports the new bridge project and ongoing efforts to expand transportation infrastructure throughout coastal Alabama. CAP has sent letters of support for the channel widening and is working with state legislators to prepare for the 2019 session which will likely include a Transportation Bill to bring state transportation funding inline with current costs. The Alabama gas tax has not been increased in nearly thirty years and an informal task force is currently looking at options to present to the Alabama Legislature. CAP is following these efforts and will continue to update our constituents as things progress.